Many new moms embark on a fitness journey after having a baby in an attempt to lose the baby weight. However what many don’t realize is that their nutritional and exercise habits prior to and during pregnancy are of great importance and can affect the health and wellness of both mother and baby during the prenatal and postpartum journey. 1. Excessive Weight Gain – This considered the biggest risk factor during pregnancy. Recommend healthy weight gain is between 25-35lbs (11-14kg). The best way to manage weight gain before and during pregnancy is to maintain healthy eating habits and regular exercise. When trying to get pregnant, eating a healthy whole foods based diet, taking a folic acid (Vitamin B9) supplement and avoiding alcohol, help prepare the body for pregnancy. During pregnancy the body requires requires an additional 340kcal to 450kcal calories per day (in the 2nd and 3rd trimester respectively), so there is really no need to “eat for two”. 2. Gestational Diabetes – Gestational diabetes occurs when the body is unable to make and use insulin properly during pregnancy. This results in an increase in blood glucose, which can cause weight gain for both mother and baby. Women with a higher starting pre-pregnancy weight and a diet high in sugary foods are more susceptible to gestational diabetes. For this reason eating healthy before and during pregnancy (watching sugar intake) is a good idea for any mom or mom to be. Partaking in regular exercise is also recommended to help burn up extra glucose and prevent/control gestational diabetes. 3. High Blood Pressure – Excessive weight gain during pregnancy can increase the likelihood of pregnancy induced hypertension. Since an increase in blood volume occurs when a woman is pregnant, the heart has to work harder. For this reason cardiovascular exercise is recommended before and throughout pregnancy to keep the heart strong and combat pregnancy induced High Blood Pressure. 4. Joint, Ligament & Lower Back Pain – There is more weight and strain on a woman’s joints, ligaments and back during pregnancy, not to mention that pregnancy hormones cause everything to “relax”. Also muscle loss during pregnancy is inevitable. Regular strength & flexibility training prior to getting pregnant and during pregnancy ,including core and pelvic floor exercises, will help combat these issues by strengthening the muscles. Even if you are already pregnant it is not too late to cultivate some healthy habits. 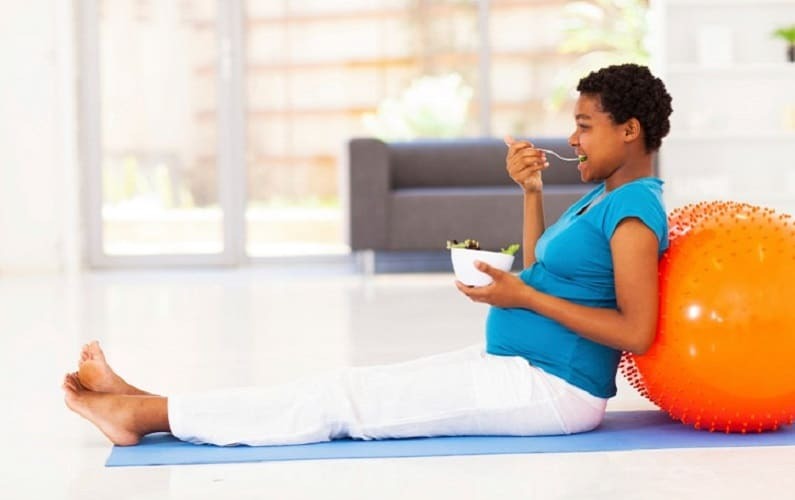 Eating healthier never hurt anyone and starting an exercise regime in any trimester is safe provided that there are no previous health concerns or complications in the pregnancy. Studies have shown that there is no correlation between exercise and miscarriages or any other prenatal complications of any kind. This Guest Blog is written by Mosope Idowu aka Bethel Fit Mum. Mosope is a wife and a mother of two beautiful children. She’s an Engineer by profession but a Fitness & Nutrition Coach by passion. Bethel Fit Mum was born out of her personal journey to health and fitness after two difficult and unhealthy pregnancies. In both of her pregnancies, she gained a lot of unhealthy weight and ended up with pregnancy related complications. She realized how important it was to cultivate healthy habits, and resolved that she would take better care of herself! She started eating healthy and exercising regularly and by the time her baby was 6 months old, she had lost almost 50lbs and was even smaller than her pre-pregnancy weight! She has since made healthy eating and exercise a lifestyle and now helps other women do the same through Bethel Fit Mum. She is a pre/post natal specialist and offers training both online and in-home. Be sure to follow her journey for awesome Mama Tips!